If you’re looking for a party bus in South Bay, look no further. White Rose Limo has an extensive lineup of custom-built party buses in a variety of sizes to fit almost any group from a few close family members right up through to the whole entourage of friends, coworkers, and extended family. Choose one of our luxury motor coaches and experience the southwest corner of Los Angeles Area in style, comfort, and elegance. 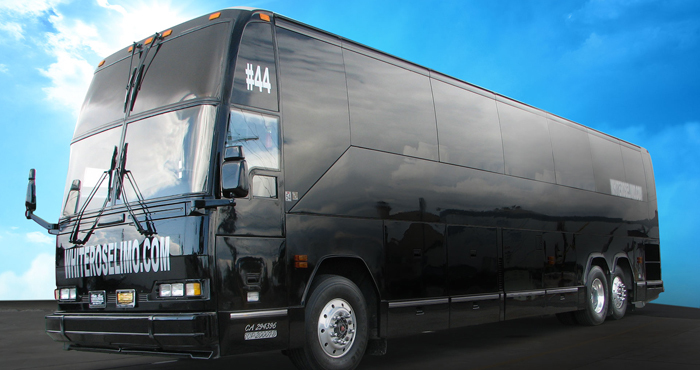 The perfect transportation for groups large and small, our party buses eliminate the hassles of highway travel and make getting there half the fun! When you’ve got a group of friends, family, or coworkers and want to celebrate something special, coordinating travel arrangements can be a nightmare. Whose car can accommodate the most people? Who is going to have to drive out of their way to pick someone up? Do you really want to play taxi driver at the end of a long day? Wouldn’t you rather simply relax? 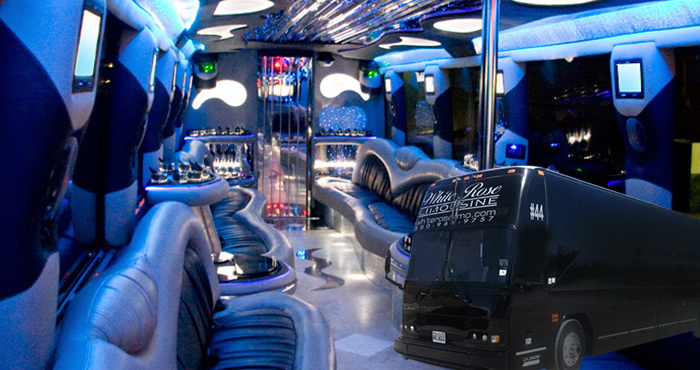 Our party bus rentals in South Bay come in a variety of sizes and can accommodate groups from 4 to 40 or more easily. That eliminates all the logistic headaches of trying to figure out how you’re going to get the whole gang from Point A to Point B. When you’re behind the wheel, how much fun are you really having? You have to concentrate on the road, the other drivers, the radio, and try to carry on a conversation with your guests. It’s no fun at all. It’s like they’ve started the party but you’re still on the clock! When you rent a party bus, the professional driver escorts you and your gang – taking the load off your shoulders so you can sit back and relax. Trouble breaking the ice? All of our party bus rentals in South Bay come equipped with onboard entertainment including video systems, surround sound stereos, lightshows, (removable) dancing poles, and a complimentary wet bar. We promise, riding the bus has never been this fun. Hate traffic? Get frustrated trying to find parking spaces? Don’t like driving after dark? Let our professional motor coach operators worry about all that so you don’t have to. 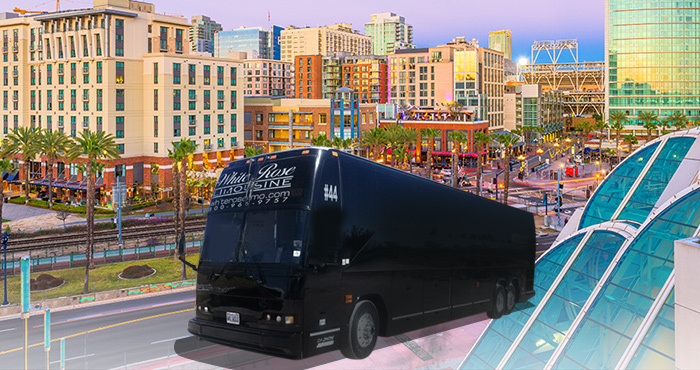 Our party bus rental services in South Bay offer door-to-door service. We’ll pick you up anywhere, take you wherever you want to go, and drop you right at the venue’s front door. When the day/evening is over, hop on the bus and we’ll take you back home safe and sound. Sounds much easier, doesn’t it? Whether you’re interested in renting a party bus in South Bay for a planned function (like a wedding, rehearsal dinner, or Quinceañera) or you’re planning an “off-the-cuff” weekend getaway with a tight-knit group of friends, White Rose Limo has the perfect ride for you. Need alternative transportation for you, your wedding party, or any of your special guests? 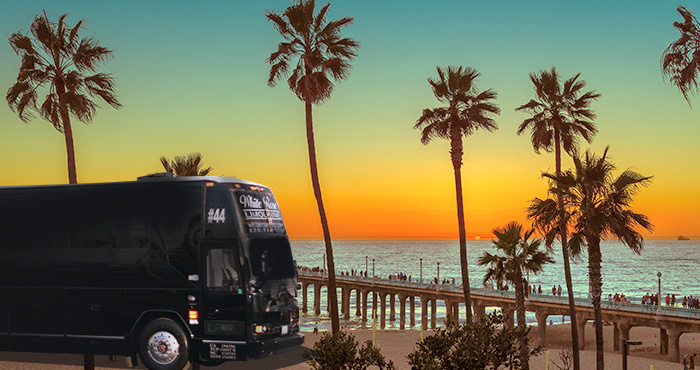 Your party bus in South Bay can carry up to 44 passengers in air conditioned, leather-wrapped luxury to and from your venues with no carpooling necessary. We make planning your rehearsal dinner, ceremony, and reception easy – all while adding a touch of elegance, style, and excitement. Worried about the kids driving on prom night? Can’t sell them on a boring old Uber? Gather a group of them and let our professional drivers do the rest. They get amazing luxury and a party atmosphere from the time they step on board. You get the peace of mind that comes with knowing they’re being driven by a licensed professional. We offer gorgeously appointed party buses in South Bay perfect for any prom, winter formal, or graduation at affordable rates. Quinceañera’s are a wonderful time for the whole family, but if you want to add a little more excitement for the adults in the group, our party bus rentals in South Bay let everyone party like they’re young again. Sometimes you just need to break away and cut loose from the real world. Let us help. 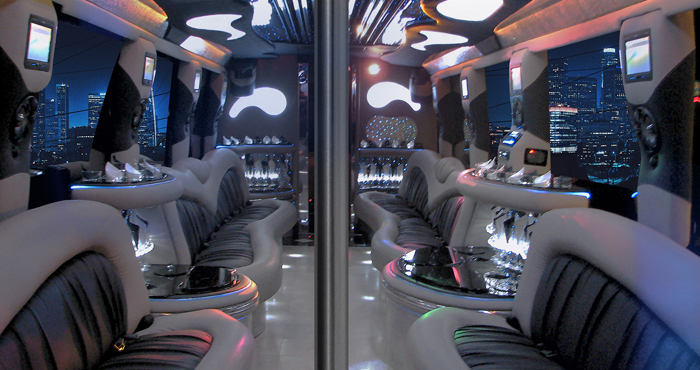 Our luxury buses make any night on the town simply unforgettable. Make memories you’ll cherish for a lifetime with close friends, family, and great coworkers. And remember, what happens on the bus . . . Looking for an excuse to get away this weekend? Checkout these excellent outings and start planning your party bus excursion in South Bay today. See a game at the Stub Hub Center—Home of LA Galaxy. Not into soccer? StubHub also hosts an amazing lineup of concerts in the summer season. And the best part is, when you rent a party bus in South Bay, you can pregame and/or tailgate for both while you’re en route. Our buses come with a complimentary wet bar stocked with the essentials (sub out your favorite brands for an additional charge). Create your own pub crawl in El Segundo. This beach town comes alive at night and you can take it all in from the luxury and comfort of your personal party bus. Get a group of friends together, split the cost and you could be paying less than you would for an Uber or taxi. This excursion also makes a great bachelor/bachelorette party. Feeling lucky? Let your South Bay party bus rental take you to any (or all) of the great casinos in Gardena. Hit up the Infamous Hustler Casino, The Normandie, or Larry Flynt’s Lucky Lady Casino and get all of your gaming done in a day. The Forum has become a landmark on the California concert scene but if you want to turn a show into an amazing evening you’ll never forget, let us do the driving. 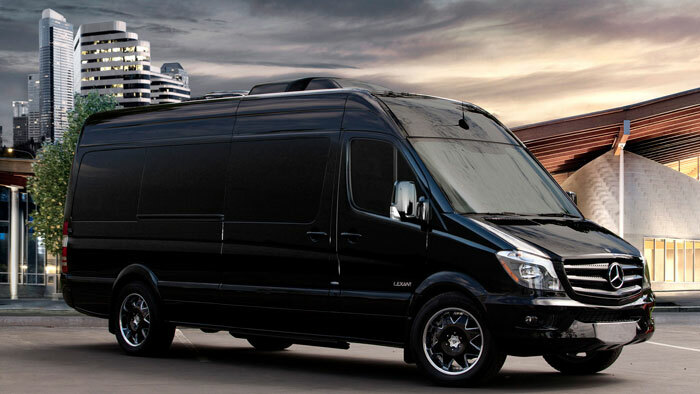 Our party buses rentals in Inglewood make great concert transportation. You get door-to-door service, comfort and elegance, complimentary beverages, and an excellent sound system to set the mood. Plus, our buses can transport large groups—up to 44—so nobody gets left behind. And when the concert’s over, you don’t have to worry about traffic—just sit back, relax, and keep the party rolling. Harbor City is home to any number of great activities that would make excellent family daytrips, corporate team building excursions, or social group outings. Let us help you makes sense of the logistic nightmare travelling in a large group always creates. Rent one of our Harbor City party buses and we’ll pick everyone up, get them there safe (as a group), and deliver them home when the day is done. Plus, our affordable rates may help your organizations save money on group travel. If you or your family is into history and culture, San Pedro is the place to be. Our San Pedro party buses can take up to 44 people in air-conditioned luxury and deliver them to any of the nature exhibitions, museums, or galleries in San Pedro. Make a day of it and see two or three, then relax on the way home with a complimentary cocktail. Don’t know what’s in store? You can visit the Cabrillo Marine Aquarium, The Los Angeles Maritime Museum, Fort McArthur Military Museum, The USS Iowa museum and more! The Manhattan Beach Pier is an icon in the area. And while you might not normally think of a party bus as the best way to get a tan, when you book with White Rose Limo we can turn your day at the beach into an all-day getaway. Have fun in the sun then hop on the bus for dinner and date night or bring the whole family to any one of the great attractions in the area without the hassle of trying to carpool or help lost relatives find their way through traffic. Had enough of Manhattan Beach? Hermosa Beach and Redondo Beach are just minutes away! No matter what type of event or escape you’re planning, no matter how large your group is, no matter how big (or small) your budget, White Rose Limo has the perfect party bus for your day in South Bay. If you already have a destination or event in mind, let us plan the transportation. Don’t have anything planned but want something fun to do? Our wonderful staff can help you plan an amazing day right in your own backyard. Contact White Rose today by calling 714-288-0066 today to see how affordable a party bus rental can really be or request a quote online.